The Samsung SSA-R2010 is a proximity card format 125KHz, 26 bit Wiegand compatible, biometric fingerprint reader for up to 1,000 fingerprint IDs. It can be networked using TCP/IP with the use of optional Samsung Access Management Software basic software for the purpose of remote fingerprint enrollment. 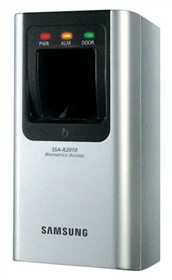 The Samsung SSA-R2010 has many exciting features for users of all types. The Samsung SSA-R2010 is sold as a Brand New Unopened Item.